When Oscar arrived in Alabama from Miami, he had hoped to apply the mechanical engineering skills he’d learned in Cuba to his new job at a poultry processing plant. Instead, he was asked to fold chicken wings on the production line. As bird carcasses sped by him, he grabbed, twisted, and folded their wings into the position the company wanted. His quota was 40 wings a minute, or about 18,000 a day. To meet this benchmark, he had to repeat the same motions thousands of times, putting pressure on his wrists and hands. After about a month, he was diagnosed with tendinitis and carpal tunnel syndrome, hand and wrist injuries resulting from overuse. When he could no longer be of service to the company because of his work-related injuries, he was fired. The grueling speed of processing lines can inflict debilitating injuries on laborers of all stripes. Workers like Oscar face constant health and safety risks in an industry that systematically exploits them in the name of profit. If you think that sounds like kind of a dumb idea, you’d be right. So dumb, in fact that the Agriculture Department rejected a similar proposal barely five years ago. are often among society’s most marginalized members. Plants are typically located in small cities and towns in the midst of rural communities, where economic opportunities are limited. Consequently, these workers are expected to tolerate severe and sometimes unlawful conditions. Increasing line speeds are driven by growing demand for poultry. Chicken has dethroned beef as America’s favorite meat, and profits are soaring. Last year, Tyson Foods, the largest poultry producer in the country, bragged about $461 million in profits over a three-month period. We’ve read before about the terrible conditions under which poultry workers labor. But the good news is that some organizations are fighting back against putting profit before people. A recent letter signed by us and 39 other organizations, implored Secretary Perdue to take the health concerns of poultry workers more seriously. What did OSHA do for poultry workers do when you were at OSHA? The GWB administration initiated some but not many “general duty clause” citations for repetitive motion hazards. 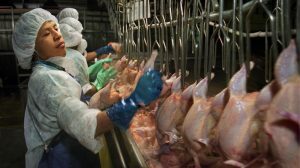 A search of the OSHA inspection database shows four “General Duty” citations classified as “ergonomic” in 2009 and 2010 and none of them for anything related to poultry processing. The inspection records do not show ANY citations classified as “ergonomic” from 2011 to the present. I don’t disagree that poultry processing is tough work and frequently the line moves at speeds which require workers to make an unacceptably high number of repeated motions, but it certainly did not seem to a be priority under the prior administration.